photosynthesis; help shorten the growth cycle. 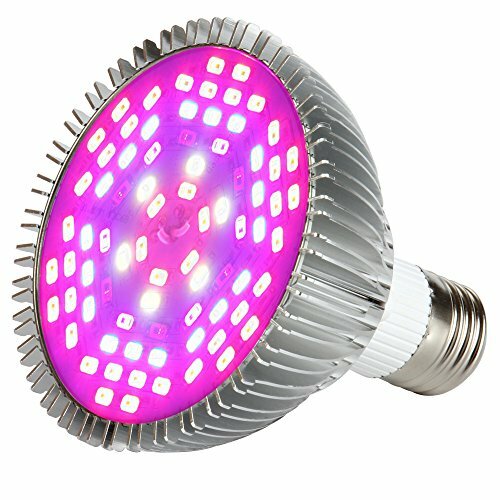 FULL SPECTRUM:78pcs High-efficiency LED chips: 42Red+18Blue+6White+6IR+6UV,Plant light can provides the most efficient wavelengths of light to enhance photosynthesis performance hence improving plants' healthy growing. SUPERIOR HEAT DISSIPATION: Made of heat-sink metal aluminum with finned heat-sink design,keeping temperatures at the appropriate level for plant growth without worrying about heat increased. ENERGY SAVING:50Watt equivalent actual power consumption of about 14W, save electricity, Size:3.96*3.7inch (D*L), long life, up to 50,000 hours. EASY TO INSTALL:it is easy to set up and use; Input Voltage: AC85-265V.